Available from Google.com/phone, the Nexus One Car Dock will cost you a grand total of $55. Used for both GPS navigation as well as playing music from your device, the dock will surely find a home with users who love convergence and would happily trade in a stand-alone GPS unit + phone for one device. Starting today, you can purchase a Nexus One Car Dock from Google’s web store, giving you the perfect place to put your phone when you’re in the car. In addition to holding your Nexus One, the car dock also charges your phone’s battery, lets you use your phone handsfree, and provides faster access to voice and navigation apps. The dock’s built-in speakers and volume controls enhance the in-car music and media experience. The Car Home app, which loads automatically, makes it easy to access Maps and Navigation, Voice Search, Contacts, and Music. You can mount the dock on your windshield or dashboard, and it ships with an adhesive disc that lets you attach it to non-smooth surfaces. The dock comes with a charger that fits into your car’s 12V utility socket, and the holder can rotate for flexible orientation. The dock costs $55 and can be purchased as a separate accessory from the web store, or bundled with the purchase of a new Nexus One phone. For more information, see the tech specs. 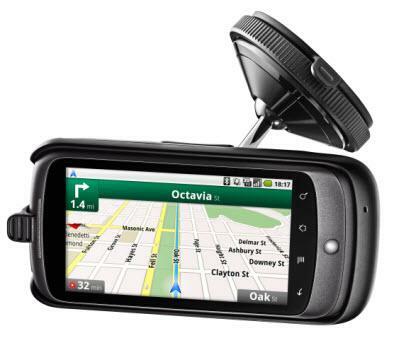 Looks exactly like the HD2 car mount, I hope T-Mobile will carry that in their stores soon. Why don’t they have one of those for the MT3G? I read you will not need BT will while driving. Audio or speaker will utilize FM radio. No FM. A speaker is built into the dock. So far, the handsfree works well, but I travel in very noisy environs, so it will be interesting to compare it to my Icon BT which works very well in noisy surroundings. Maybe some of you idiots should RTFM before you throw out complaints about non-problems. It has a suction cup for windshield mounting, and an option for mounting on a solid rough surface like a dash or console. And it gives you the option to use a BT headset or to use the dock as a speakerphone through the dock’s built in speaker. Will it transmit music through FM radio?